Brutal attack Monday on 2 opposition MPs, blamed on suspected ruling party supporters, was stark reminder that Cambodia’s post-2013 election tensions have not abated. Relations between Cambodia’s ruling party and the opposition deteriorated further this week after a mob beat up two opposition legislators as they left parliament. That incident, which was blamed on suspected ruling party supporters, comes after numerous warnings from Prime Minister Hun Sen that the country would return to civil war should his party lose the 2018 general election. The assault on Monday followed the breakdown earlier this year of the so-called culture of dialogue between Prime Minister Hun Sen and opposition leader Sam Rainsy — a process that was, in theory at least, meant to ratchet down tensions. The assailants attacked the two lawmakers as they left parliament, dragging them from their vehicles and inflicting serious injuries. Witnesses say police and security guards nearby did nothing to help the two MPs, who are now hospitalized in Thailand. The violence came shortly after hundreds of supporters of the ruling Cambodian People's Party protesting outside parliament, demanding that opposition deputy head Kem Sokha resign his position as vice-president of the legislature. FILEe - Cambodia's main opposition Cambodia National Rescue Party Deputy President and National Assembly Deputy President Kem Sokha, center, speaks to reporters outside the Phnom Penh Municipality Court in Phnom Penh, April 8, 2015. That echoed a recent demand by Prime Minister Hun Sen that the country’s courts charge Kem Sokha with trying to overthrow the government. 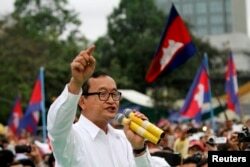 In a television address Wednesday, Hun Sen condemned the attack and ordered the arrest of those responsible. During his brief speech, Hun Sen also insisted the ruling party was not behind the attack. 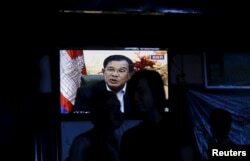 Cambodia's Prime Minister Hun Sen is seen on a television as he delivers a speech, at a restaurant in central Phnom Penh, Oct. 28, 2015. A government committee comprised of CPP officials has been tasked with investigating what happened. Political analyst Ou Virak, the founder of the independent think tank Future Forum, says many people believe CPP members were responsible. “I think there’s plenty of evidence, plenty of videos, plenty of footage to show that it must be coming from elements from the ruling party, but I think the question is actually whether it was sanctioned by that,” said Ou Virak. And, he adds, people are skeptical that the investigation committee will do its job impartially. Ou Virak noted that Hun Sen did not mention a second thuggish incident on Monday during which protesters, again unhindered by police, threw rocks for several hours at Kem Sokha’s home while his wife and others cowered inside. Cambodia’s armed forces joined in the protests this week. Soldiers were pictured holding banners demanding that Kem Sokha step down. Senior government officials have backed the soldiers' actions on the grounds of freedom of expression. The events follow numerous warnings by Hun Sen in recent months of civil war should the opposition win the next general election, which is scheduled for 2018, and an array of verbal attacks by the prime minister against Kem Sokha and opposition leader Sam Rainsy. In recent weeks some analysts, including Ou Virak of Future Forum, have expressed surprise that the CPP — which has for decades been accused of using intimidation and violence to retain power — looks to have started down that road already. In the meantime, Virak expects the CPP will continue its tried and tested policy of using the courts against Sam Rainsy, and using physical harassment against Kem Sokha.